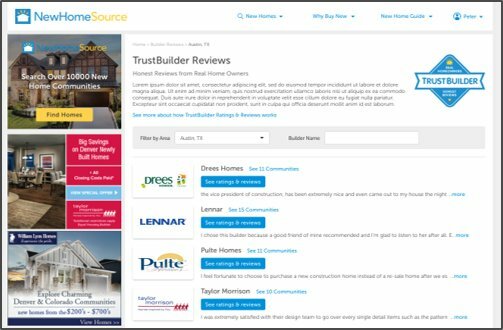 Powered by NewHomeSource.com, the TrustBuilder ratings and reviews program delivers honest reviews from real homeowners about the home buying experience. The program creates the industry destination for reviews that are independent, transparent and credible, driving a truer and more positive representation of home buyer sentiment. BDX is always trying to add value for our clients and lead the home building industry on important initiatives. The TrustBuilder program does just that! Unlike almost every other industry, there is not a single place to go to find honest credible ratings and reviews. Most of what does exist online is negative and unbalanced. TrustBuilder fills this gap and solves an ongoing challenge for our builders. Reviews are good for business. Reviews have become an important part of the buying process for today’s shoppers. 93% of consumers read product reviews before making an online purchase. And research shows that brands that have more reviews see an increase in sales. Putting the industry’s best foot forward. Most pre-existing industry reviews are unsolicited – and therefore dominated by an unhappy few. By leveraging sold home data provided by builders, BDX is able to provide a true representation of homeowner sentiment. Driving builder leads and creating trust. 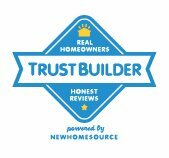 The TrustBuilder program on NewHomeSource.com will offer more builder reviews than any other website, marginalizing poor ratings resulting from unsolicited reviews. The resulting increase in site traffic will also drive additional leads from new home buyers – buyers who have an increased level of trust entering the sales process. There is no cost to participate. The TrustBuilder program is FREE for all BDX clients. We manage the whole process of soliciting reviews and moderating the content. We have partnered with Bazaarvoice, a leader in this space to bring builders this program. Today’s shopper wants both peer-to-peer and expert points of view from people they trust. 79% of consumer trust online reviews as much as personal recommendations. 73% say positive local reviews make them trust a business more. 70% of Americans look at product reviews before making a purchase. 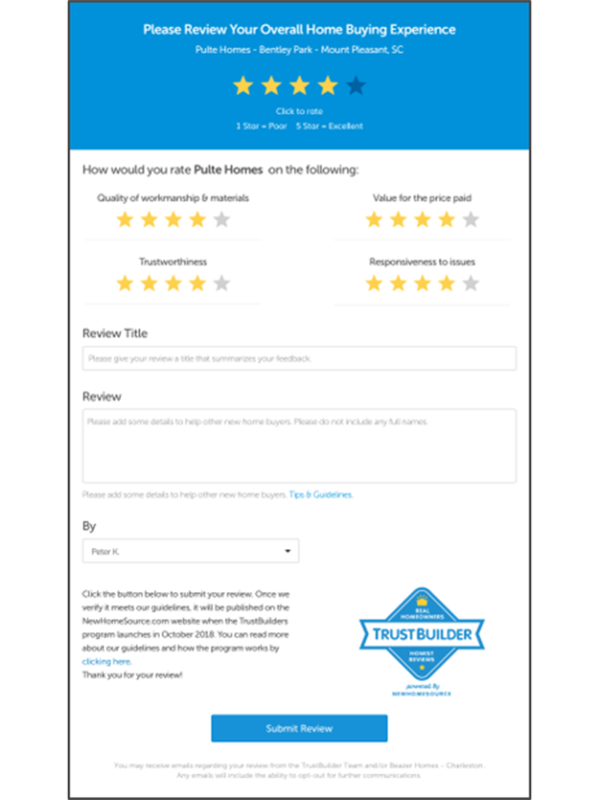 TrustBuilder brings homeowners honest reviews from real home buyers. 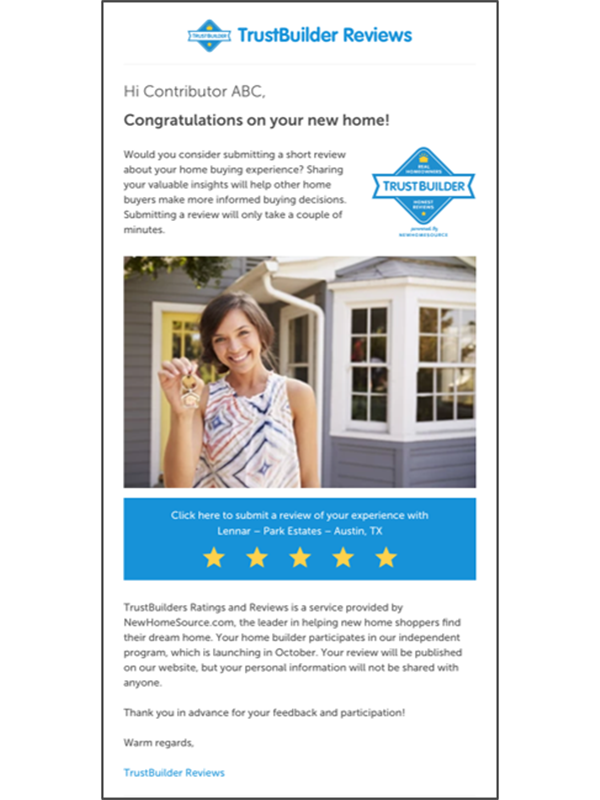 The program creates the industry destination for reviews that are independent, transparent and credible, driving a truer and more_x000b_positive representation of homebuyer sentiment. Homeowners receive a cross-section of balanced information from people who have purchased a home from the builder. The program is highly credible and designed to gain trust from buyers.